First I am not a lawyer nor an insurer. The information in this article is intended to be used for informational purposes only and is not intended to be legal advice or self-defense insurance advice. YOU must perform your own research and determine which, if any, will be applicable to you. You have just used your sidearm to defend your life. You have just had the fight for your life, now you are in for the fight of your life. Defending yourself from using deadly force can cost a lot of money. Some recent instances cost the over $100,000 and, in one case, over $2,000,000. Not everyone has the funds available to cover the costs of a trial, especially when you consider attorney fees, court costs, expert witnesses etc. This is where self-defense insurance plans come into play. There are several companies offering insurance offering various degrees of coverage at a wide range of costs. Not all insurance plans are created equal nor do they provide the coverage you may need. Bail Bond – You need to be prepared as most likely you will most likely be arrested, taken to jail, and will need to post bond to be released. Will the insurer pay up front for the bail? Some will pay at varying degrees up front for bail, while others only after you are acquitted. Lawyer – Lawyers will want up front money prior to taking your case. Some insurers will cover lawyer costs up front (at least in part) and others only if you are acquitted. If you select an insurer who will pay legal fees pending acquittal you will need to ensure you have sufficient savings to cover costs of the legal team. If you select an insurer who will cover the costs up front make sure you know what the limits are as you will be responsible for expenses beyond the covered limit. Keep in mind that most insurers will want access to case files to make an assessment and determine if they will provide additional funds. Lawyer Selection – can you select your own lawyer or is one assigned? If the lawyer is assigned what is their level of familiarity with Self-defense cases? Will the attorney be able to effectively mount a defense for you? Why not keep a lawyer on retainer (just in case)? The issue is you are putting down funds for an event that (hopefully) will never happen. Most lawyers will not take a retainer for an uncertain future case as they will have to account for and track the money for years, or even decades. What happens to your money if the lawyer closes shop? Non-Lawyer expenses – will the insurance cover costs for expert witnesses, investigators, co-counsel etc.? What is the limit for these expenses? Remember, you will be responsible for expenses beyond plan coverage. Non-Firearms Self-Defense – if you do not use a firearm for self-defense (voice command, baton, pepper spray etc.) will that be covered? Some insurers will only cover firearms usage and a person legally carrying firearms have been arrested for verbalizing their INTENT to use a firearm to defend himself. Gun-Free Zone – If you carry in a Gun-Free Zone are you covered? What about other areas you are not permitted to carry (bars, parks, public areas etc.)? What if you carry where it is posted ‘No Weapons’? How is your case handled – When you report a Self-Defense claim will you be referred to someone on staff who has familiarity with self-defense issues or will they refer you to an external third party? Will the focus be on your defense or minimizing expenses? 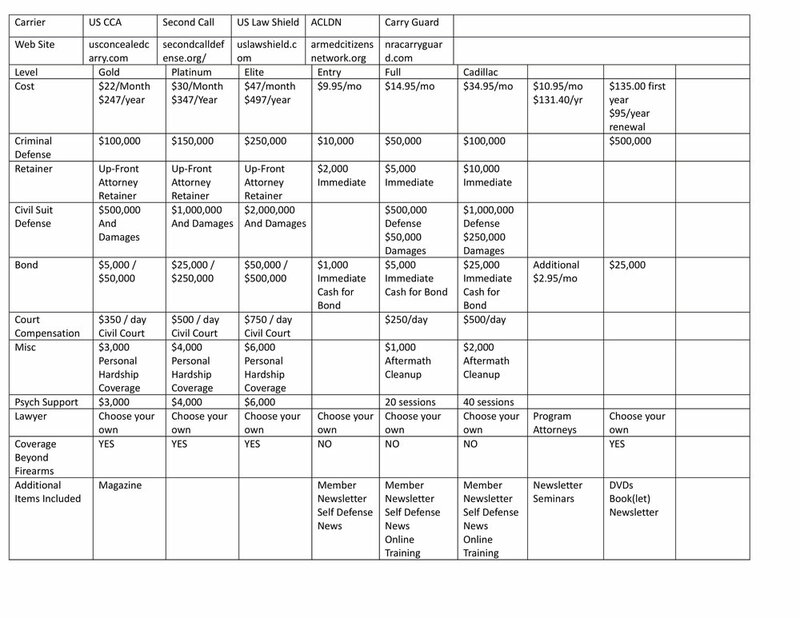 Insurer Solvency – How much money do they have on-hand to pay for your defense? You would not want to pay for insurance just to find out that they do not have sufficient funds to pay for your defense. Civil litigation – You will most likely be sued civilly, will this be covered? What are the limits? Are the limits in conjunction with or in addition to the self-defense criminal limits? Risk aversion preference – how willing are you to assume risks of paying for your defense. Ability to pay costs involved for your defense. Regardless of your decision to obtain legal insurance you need to consider learning about self-defense laws in your state and areas you frequently travel. Self Defense laws vary based on states, counties, cities and you should be familiar with the law. There is a difference between what the right thing to do is and what is legally right to do. Knowing and following the law is extremely important. This data is current as of 1/1/18. The data was based on what could be obtained from the issuer’s web site. If other sites had information that was not considered as it was not first hand from the issuer. The NRA Carry Guard is not completed as data on their insurance could not be located on their web site. You can also see additional information on http://vcdl.org/legal-plans. This is from a survey conducted in November 2017.